I figured out the back sprite problem folks. I never inserted &H in AgiXp when going for the backsprite. So that would make sense on what it never appeared. I always assumed AgiXp corrected that for me. Now I haven't tried it yet, but I did have the same problem with tiles, and used &H this time....came out scrambly though. For tilesets you have to use Horizontal instead of Vertical. Can this tool insert sprite of No.252 pokemon? I will insert new pokemon,how can I do? I have never added a new pokemon, only replaced existing ones. 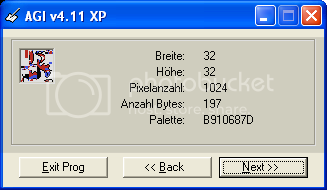 I believe that to add a new sprite you would have to repoint the pointer table of pokemon pictures, insert the sprites manually with Agixp, and then manually enter the pointers for them at the end of the list. But this is just speculation, as I haven't really tried yet. Oh,that's quite difficult,and I can"t find the pointer table.Did Nobody do it before? I know its been done before, Koolboyman did it, but nobody has written a tutorial on it. That's amazing,I have called him to help,but no answer,I think he is so busy.Can anybody contact him or write a tutorial? I think many people's requirement is same as me. that can help many people. I repoint the No.252 pokemon,but it still can't work. Seriously, go look at a debugger once in a while. Then you'll figure this out on your own. Could you introduce me a good debugger? So that I can figure that out on my own. That's very strange.I changed at 40C1C - Ammount from 0xfb to 0xfc,and I also changed at 44360-44556 Pointers to Pokedex Data.The pokedex can work when I catch it in the battle,but it can't be saw in pokedex of menu.I changed at 48000-485DF Pointers to Pokepics ,but the pokepic of No.252 can't work. so I think maybe there is global amount of pokemon somewhere. Adding new pokemon to generation II is successful. You can see my thread. I have a few questions about inserting backsprites. All I want to do is replace Hiro's backsprite with a custom Lance backsprite. I have read and re-read this thread over and over, and it really is not making sense to me.. So I load up AGIXP, but do I select Pic-Offset rather than pokemon/trainer-pic extracting? On the resource thread, I found the offset at which Hiro's backpic is stored, or is that just a pointer? anyway, when I build the compression, it does not show anything close to it when I use &3F9CB. I figured it out. I wasn't using &h because I tried it one time, and AGIXP crashed, so I figured that was an invalid command. But it must have been something in the code i put. Anyway, great tutorial, Mateo! Why? It's 48x48 D: Btw, it's a Bagon. How to insert pokemon Red to Agixp? You cannot use Agixp to insert Pokemon in Pokemon Red. It only supports Gold and Silver (not even Crystal). Pokemon red uses a different compression format. @Mateo, did you know a tool to compress sprite for pokemon RBY? Found this near the top of the Tools section. Not sure exactly where I should be posting this, but I might as well try here at least. I've been encountering a very strange issue with AGIXP. I used to have no issues inserting graphics with this program, but now it's suddenly started producing very glitchy stuff. For example. After insertion, when I actually meet her in-game, she is a glitchy mess of what I believe were Suicune's hind legs and black bars. Which makes zero sense, because Chibi Komachi is the No.60 slot in my hack (where Poliwag used to be)! I extracted the graphic, and this is what came out. Apart from the fact it looks nothing like the image I inserted, the dimensions are also wrong compared to the original image. I'd like to know why this could be happening, and how to solve this problem. I've had this problem before too, with trainer sprites usually. I honestly don't know how to fix it other than to make backups (in case it is accidentally inserting your sprite over other data) but its possible that it has just messed up the pointer when it was saving it. You could load her data and check. If you went back to a backup, you could tell it an offset manually when inserting (or just write down the offset that it comes up with) and that way you can check to make sure the pointer is correct (and fix it if it isn't). Well, I've been backing up my ROM ever since this happened before accompanied by some game-breaking glitches. As for repointing the data? Possible. Last night, I was thinking of taking a different approach, where I would manually insert the sprites by finding out exactly where in the ROM the images are stored so I could properly insert them in a more direct manner, except I couldn't quite seem to find a list of the offsets. I have a hunch I know which banks they're stored in, but I'd rather not end up overwriting other sprites I've inserted thus far.